Of the 10 finalists in the 2018 Young Scientist Challenge, five were Indian Americans; Mehaa Amirthalingam finishes second. 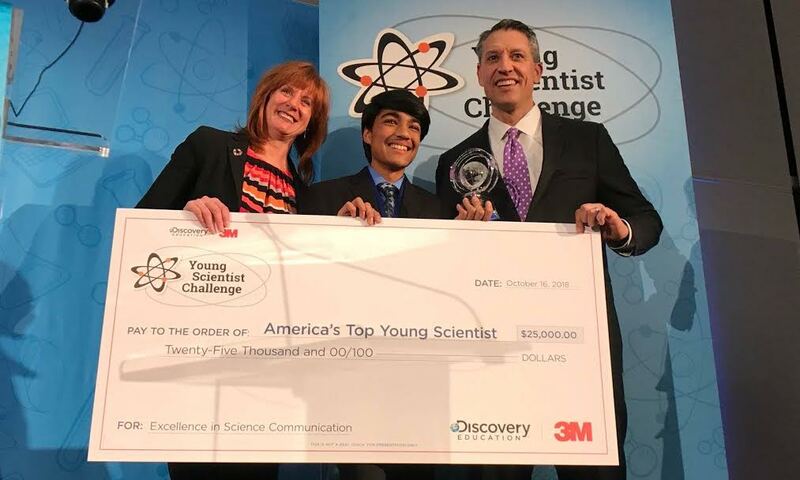 St. PAUL, Minnesota, October 19, 2018 – For three consecutive years, Indian American whiz kids have won the highly competitive Discovery Education 3M Young Scientist Challenge. This year, Rishab Jain, 13, of Portland, Oregon has earned first place in the annual premier competition for middle school students. Young Rishab aspires to make the treatment of pancreatic cancer more effective, so he has created a method that uses artificial intelligence to help accurately locate the pancreas during MRI radiotherapy. For his invention of the Pancreatic Cancer Deep Learning System (PCDLS) tool, he was conferred with the title of ‘America’s Top Young Scientist’, awarded the grand prize of 25,000 dollars, and an opportunity to attend a taping of a Discovery Network show. The competition was held over two days, October 15-16, at the 3M Innovation Center in St. Paul, Minnesota, where young change-makers were evaluated on a series of challenges including a presentation of their completed project. Targeting the pancreas poses a challenge in radiation treatment for pancreatic cancer: It is often obscured by the stomach or other nearby organs making it difficult to locate the pancreas; Breathing and other anatomical changes may cause the pancreas to move around in the abdominal area. As a result, radiotherapy treatment can inadvertently target and impact healthy cells. Regarding his future career goals, he aspires to be either a biomedical engineer or a doctor so that he can “keep developing technology to find a cure for cancer and improving people’s lives,” he says. Following Rishab’s win, Indian American kids have been crowned champion of the competition for three years in a row, and in five of the last seven years: Gitanjali Rao (2017); Maanasa Mendu (2016); Sahil Doshi (2014); and Deepika Kurup (2012).